Evidence suggests that the Earth's average temperature is becoming warmer. Because atmospheric warming will be most readily apparent in the melting of perennial and permanent ice, and because most glaciers are small relative to vast ice sheets and expansive sea ice , glaciers are important indicators of climate change. Approximately 160,000 glaciers are found on Earth; more than 40 have been monitored since (at least) the 1980s. One of these monitoring projects is Global Land Ice Measurement from Space (GLIMS), which uses laser altimetry to help determine glacier volume. The results of such observations are clear: Earth's glaciers are disappearing. Consider the following. Over the past 100 years, global mean (average) sea level has been rising at an average rate of 1 to 2 millimeters per year. A possible contributor to sea-level rise is increased meltwater from the snow and ice of glaciers, ice sheets, ice caps, icebergs, and sea ice. Glaciers in Alaska and neighboring Canada, with a combined area of approximately 90,000 square kilometers (roughly 35,000 square miles), and accounting for about 13 percent of mountain glaciers on Earth, have thinned substantially. Over the last 40 years, thinning has been on the order of 50 to 100 meters (several hundred feet) at lower elevations of glacier occurrence, and about 18 meters (60 feet) at higher elevations. Many glaciers in South America's Andes are melting so fast that, if the current rate continues, they could disappear by 2020. The Quelccava glacier in Peru retreated 32 times faster during the period 1983–2000 than in the 20 years from 1963 to 1983. In the Patagonian ice fields of Argentina, glaciers have receded 1.5 kilometers since 1990. The ice and snow of glaciers tell an environmental story the way tree rings do. Periods of glacier melting (shown here) will be discernible from periods of growth (i.e., snow and ice build-up) by physical differences in the snow and ice layers. The horizontal "stripes" of sediment within the glacier indicate seasonal patterns of snow and ice accumulation and melting. In Africa, Mount Kilamanjaro's ice fields have shrunk by a least 80 percent since 1912. Mount Kenya's ice cap has shrunk by 40 percent since the 1960s. The 15,000 glaciers of the Himalayas, which collectively constitute the largest body of ice outside the polar caps, are reported to be receding faster than anywhere on Earth. Some 2,000 have melted since the 1950s. Instead of snow accumulation in winter, Himalayan glaciers are being hit by summer monsoon rains. 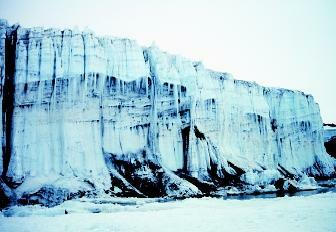 The Dokriani Barnak glacier has receded about 0.8 kilometer since 1990. If Himalayan glaciers recede at this rapid rate, they will be gone by 2035. In the European Alps, several glaciers have disappeared entirely since the 1960s. Permanent sea-ice cover in the Arctic Ocean is shrinking by an area the size of the Netherlands each year. The Arctic ice cap thinned from 3 meters (10 feet) in 1970 to 2 meters (nearly 7 feet) in 2000. In Glacier National Park in Montana, the number of glaciers has dropped from an estimated 150 in 1850 to only 50 in 2000. At this rate of decline, all of the glaciers in the park will be gone by 2030. In addition to the loss of ice and potential threat of a rising sea level, there are other ecological and environmental concerns posed by the melting of snow and ice. For example, increased iceberg calving can bring changes to the Antarctic ecosystem by blocking sunlight needed for the growth of microscopic phytoplankton , the base of the marine food chain. In addition to the increased presence of icebergs, smaller icebergs that break off from a larger mass can form dams along the coast, preventing some of the pack ice from drifting out to sea in summer. This increased ice cover can cause a decline in plankton productivity due to reduced sunlight penetration. Large icebergs also can disrupt penguin colonies and interfere with breeding success. Massive flooding is predicted in areas where glaciers are receding, particularly in the Himalayas. By one estimate, 20 percent of Bangledesh will be under water by 2020 if the current rate of glacier melting continues. The absence of glaciers will have a significant effect on late summer streamflow and stream temperature in mountainous watersheds (drainage basins). Both of these properties are important in maintaining fish populations. In streams historically dependent on meltwater, sufficient quantities of meltwater must be present to ensure adequate habitats for stream biota, and to keep stream water cool. Temperatures too warm, often above only 13°C (55°F), may have an impact on the survival of young fish. Moreover, many sources of drinking water for large cities in mountainous regions would be negatively affected by the loss of glaciers because the streams that supply their water will flow at a considerably lower volume. Attendent to global warming is a potential change in precipitation patterns. In Montana's Glacier National Park, one computer model suggests a 30-percent increase in precipitation and a small increase in average temperature. One of the likely results of this is a redistribution of types of trees. For example, cedar–hemlock forests may expand in lower elevations. Sub-alpine fir trees may become nitrogen-stressed at the current treeline. Coarse woody debris accumulation may increase the frequency of large stand-replacing forest fires in other areas. The United Nations Intergovernmental Panel on Climate Change is trying to assess the impact of humans on global climate. Scientists disagree over the actual cause of rising temperatures and to what degree greenhouse gases are responsible. With respect to the recession of glaciers, some scientists claim that the melting effects have been exaggerated and that recently observed melting events are due to natural variation in Earth's climate. Yet all seem to agree that the nature of the melting events and the underlying causes need to be better understood. SEE ALSO Glaciers and Ice Sheets ; Glaciers, Ice Sheets, AND Climate Change ; Global Warming and the Hydrologic Cycle ; Ice at Sea ; Oceans, Polar . Intergovernmental Panel on Climate Change. Climate Change 2001: The Scientific Basis. Geneva, Switzerland: World Meteorological Organization and UN Environment Programme, 2001. Available online at <http://www.grida.no/climate/ipcc_tar/wg1/index.htm> . Williams, R. S., and J. G. Ferrigno, eds. Satellite Image Atlas of Glaciers of the World. U.S. Geological Survey Professional Paper 1386-J (2003). Glacier Retreat in Glacier National Park, Montana. U.S. Geological Survey. <http://nrmsc.usgs.gov/research/glacier_retreat.htm> . Intergovernmental Panel on Climate Change. <http://www.ipcc.ch> . Sea Level and Climate. U.S. Geological Survey, Fact Sheet FS-002-00 (2000). Available online at <http://pubs.usgs.gov/fs/fs2-00> . World Data Center for Glaciology. The National Snow and Ice Data Center. <http://nsidc.org/wdc> . * See "Glaciers, Ice Sheets, and Climate Change" for a photograph of the breakup of the Larsen B Ice Shelf in 2002.